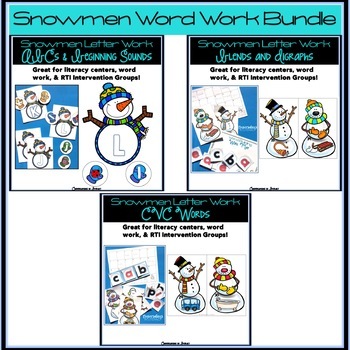 Students will have "snow" much fun matching lower case letter mittens and beginning sound mittens to the correct capital letter snowmen, building cvc short vowel words, and building blends and digraph words with these super cute snowmen and snowballs! Students choose a snowman with a picture. Then they record their word on the recording sheet after building it using snowballs in the sound boxes. This activity works great for literacy centers, word work, and RTI Intervention Groups!